Credit card debt not only drains you financially, but it can drain you mentally as well. You worry regularly as well as lose sleep at night wondering how you are going to dig your way out from under a pile of debt. Consumer debt help can consist of a home equity loan or transferring your debt to a low or zero percent interest credit cards as well credit card debt consolidation with a consumer credit counseling agency. While either of these options can help with debt, a home equity loan is secured with your home. If you don’t own a home with equity, this option does not exist for you. If do own a home, you could risk foreclosure if you default on this loan. Paying off credit card debt with your home, has its risks and would not be something I would do. Zero interest credit cards can work if the credit limit is high enough to cover the debt you are trying to consolidate for payment. You also must be able to pay the debt off before the introductory interest rate expires…usually 3 – 24 months. Some people will actually transfer the unpaid balance to another credit card with a low introductory rate. This method can work, but it takes careful monitoring to ensure payments are made on time and you aware of when the interest rate increases. The most worry-free method for consolidating consumer debt is a non-profit consumer credit counseling service. These services are in the business of helping people make choices about their debt. Sometimes a financial situation does not leave many choices but to file bankruptcy and start over. The thing about debt is if you are in over your head, the longer you wait to seek debt relief the more the situation will snowball and become insanely out of control. 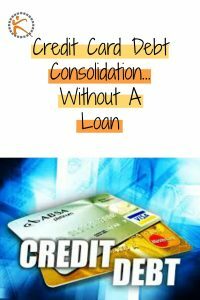 If the following sounds like your situation you could be a good candidate for a debt consolidation plan with a credit counseling organization. If you thinking you have too much debt, you probably do. Remember that talking to a credit counselor does not obligate you to anything. It just gives you information to make an informed decision. If you are worried about your credit score, don’t be. Your credit score may go down at first because your creditors will close the accounts that are enrolled in the program. But as your debt decreased, your credit score will increase and by the time you complete the program, it will be stronger than ever. If have debt, make plan for repayment. There are a lot of great books that outline how to repay debt, how budget and save for the future. If you feel you need professional help, organizations that are members of the NFCC certified consumer credit counselor online or in your town.